Certificate only valid towards the purchase of a Quadra Fire Pellet/Wood/Coal Stove. One Certificate Per Stove Purchase. CERTIFICATE NOT VALID FOR THE PURCHASE OF WOOD PELLETS. Mt Tom Energy has been selling Pellet Stoves and Wood Pellets in Western Massachusetts since 1995. In 1959, McKenney Electric Co Inc/Mt. Tom Energy opened its doors as an electric motor repair family-owned company. Today, we still continue repairing and replacing electric motors, but we also have expanded our business to include the sales, service and parts of wood, pellet and coal burning stoves. 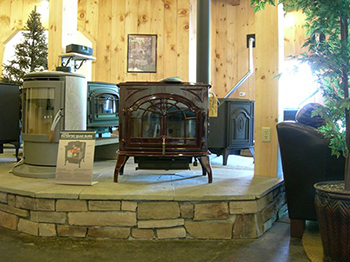 We carry Quadra-Fire, Heatilator Eco-Choice, Hearthland and Alaska stoves. We also have a great selection of accessories to compliment the use and look of your stove. McKenney Electric Co Inc /Mt. Tom Energy sells and delivers New England wood pellets, as well as coal. Nothing burns like a quad. Please come in and visit our new showroom located at 100 Northampton Street (Rte 5, 1/4 mile from the Oxbow), in Holyoke, MA. We are open Saturdays on season. McKenney Electric Co Inc/ Mt. Tom Energy serves the metro area. One Certificate Per Stove Purchase, No Multiple Certificates. Coupon only valid towards the purchase of a Quadra Fire Pellet/Wood/Coal Stove.